Modern Danish sterling silver pitcher by Michelsen, date marked for 1928. 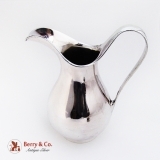 This elegant pitcher is 7 1/8" tall, 6 3/8" across the handle and the spout and weighs 342 grams or 11 ozs Troy. The pitcher has an identical design to Kay Fisker's work. 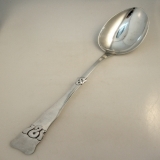 Danish 830 Standard silver serving spoon, date marked for 1922. 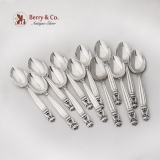 This most attractive spoon is 7 1/4" long and weighs 42.2 grams or 1.35 ozs Troy. 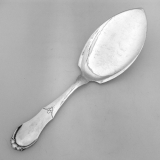 The spoon is inscribed Frinrring fra Soster. Danish sterling silver rectangular cufflinks with stylized floral swirl designed by Henry Pilstrup for Georg Jensen Silver Company, c.1950. 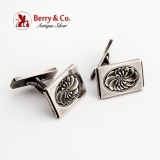 These handsome cufflinks are 7/8" long,1/2" wide and weigh a total of 19.8 grams. Danish sterling silver Modernist Bracelet by Hermann Siersbol, Denmark, 1970. This handsome bracelet is 6 3/8" long, 1/2" wide, the medallion clasp is 1 1/8" in diameter and weighs 31.9 grams or 1 ozs Troy. 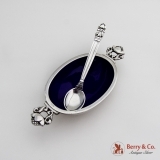 Danish sterling silver unusual oval salt dish and spoon, the dish has cobalt blue enamel interior, the set is in the Acorn pattern by Georg Jensen, the dish has a GI and 662 mark. The dish is 3 78" across the handles, 1 3/4" wide, 7/8" tall, the spoon is 3 1/4" long, total weight is 57.1 grams or 1.84 ozs Troy. Danish sterling silver Christmas spoon with enamel Christ decorations by Anton Michelsen, 1984, Juleskeen. 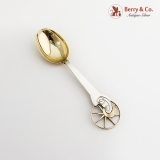 This beautiful spoon is 6 1/2" long and weighs 45 grams or 1.4 ozs Troy. 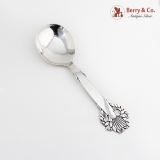 Danish sterling silver berry spoon in the Acorn pattern by Georg Jensen. 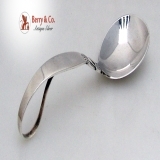 The spoon has pierced bowl and is 9 5/8" long and weighs 115 grams or 3.7 ozs Troy. 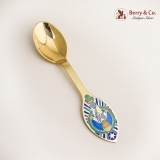 This great spoon is 6 1/8" long and weighs 33.7 grams or 1.1 Ozs. Troy. 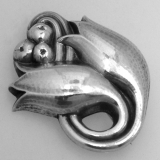 Danish sterling silver berry or casserole spoon in an unusual openwork wreath pattern by Frigast of Copenhagen Denmark, c.1960. 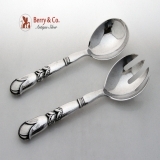 This large, attractive and useful serving spoon is 10 3/8" long and weighs 122 grams or 3.9 ozs. Troy. Danish White Enamel Flower Brooch Gilt Sterling Silver by A. Michelsen, 1935. Boxed. This stunning brooch is 1 5/8" long, 3/4" in diameter and weighs 4.6 grams. 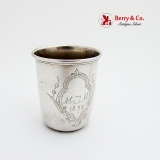 Vintage Engraved Shot Cup Danish 830 Standard Silver 1894. It has an engraved monogram "M.J.M." on the front. This nice cup is 1 7/8" in diameter, 2 1/8" tall and weighs 30.8 grams. Akkeleje Pattern Pie/Pastry Server Georg Jensen 830 Standard Silver 1918. 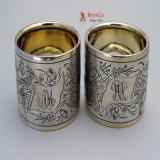 It has an engraved monogram "B" on the back of the handle. This magnificent server is 10 1/2" long and weighs 91.4 grams or 2.9 Ozs. Troy. Danish Modernist Blossom Figural Salt & Pepper Shakers Pair Georg Valdemar Nielsen Sterling Silver c. 1950-1960, Copenhagen. Boxed. 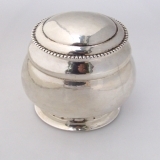 These charming shakers are 7/8" in diameter; the decorative parts are 2 long and 1 3/8" wide. Total weight is 26.6 grams. Danish sterling silver Christmas spoon for 1942, "Madonna and Child" in white enamel with gilt decorations by A. Michelsen of Copenhagen, Denmark. 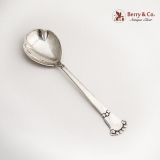 This splendid spoon is 6" long and weighs 40.1 grams or 1.3 Ozs. Troy. 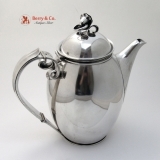 Danish sterling silver Art Deco coffee pot by Carl M. Cohr of Fredericia Denmark, c.1930. This stunning coffee pot has a removable, cast Blossom finial and a C shaped flat handle with a leaf thumbpiece and a reverse scroll upper handle socket on a bulbous body. Weighing a substantial 844 grams or 27.1 ozs. Troy, the pot is 8 1/4" tall, 4 1/2" in diameter and 8 1/4" handle to spout. 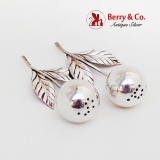 The soft, warm, original finish is present, with no buffing or machine polishing. The excellent original condition and clear, crisp detail, with no monograms, removals, repairs or alterations, make this an especially attractive offering. 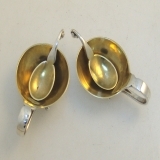 Danish sterling silver three piece coffee set in a Blossom pattern number 4 by Georg Jensen, 1925-1932. 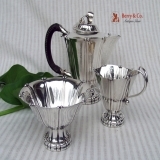 This handsome set measures: Coffee pot 6 3/4" tall, 4 1/8" tall, sugar bowl is 3 1/8" tall, total silver weight is 777 grams or 25 ozs Troy. The soft, warm, original finish is present, with no buffing or machine polishing. The excellent original condition and clear, crisp detail, with no monograms or removals, repairs or alterations, make this an especially attractive offering. Danish sterling silver curved handle sauce spoon in the Cactus pattern by Georg Jensen Silversmiths of Copenhagen, Denmark c.1950. 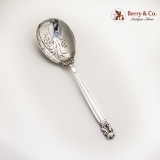 This elegant and useful serving spoon is 5 1/4" long and weighs 34 grams or 1.1 ozs. Troy. 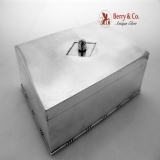 The soft, warm, original finish is present, with no buffing or machine polishing. The excellent original condition and clear, crisp detail, with no monograms, removals, repairs or alterations, make this an especially attractive offering. 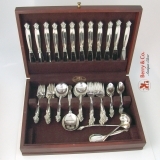 Offered elsewhere for $225, our price of $195 is as special as the spoon itself. 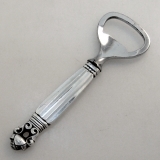 Danish sterling silver ice tong in the Acorn pattern by Georg Jensen of Copenhagen Denmark, c.1945. 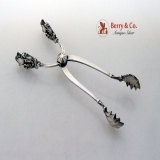 These elegant and useful spring loaded scissor tongs have pointed shell bowls and are 6 1/8" long and weigh 67 grams or 2.2 ozs. Troy. 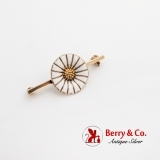 The soft, warm, original finish is present, with no buffing or machine polishing. The excellent original condition and clear, crisp detail, with no monograms, removals, repairs or alterations, make this an especially attractive offering. 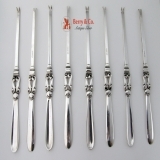 Offered elsewhere for $611 - $1175 , our price of $495 is as special as tongs themselves.